Despite Facebook's reputation for frivolity, digging deep into the site's features uncovers a layer of tools that are serious enough for it to replace some of your desktop team-working, scheduling and productivity tools. Its strength is making communication within groups easy to do and easy to manage. The site's modular structure also makes it possible to add handy features that are missing from the standard version of the site. In this article we'll focus on tweaking Facebook's privacy settings to make it more secure for serious work, and use built-in features to schedule and collaborate. There are usable productivity tools built right into Facebook's main interface. One of the best is the Groups feature. This application includes valuable collaboration features like event listing and a full discussion board. They're ideal for scheduling work and – because they're online – can be accessed from any computer with Internet access. 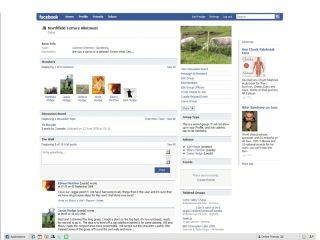 You'll also find the usual Facebook stalwarts: a public 'wall', posted items board, photo album and news feed. Any Facebook member can create a group and invite users on their friends list to join. To find the Groups application in Facebook, click the 'Home' link to go to your Facebook homepage (rather than your Profile page) and choose 'Groups' from the Applications panel. If you can't see the Groups link, click 'More'. If you still can't see it, click 'Edit' next to the Applications label and check the full list of installed applications for the Groups app. When you've found the Groups link, click on it to see a page showing groups that your friends belong to – alongside a list of groups you may already belong to. To begin making a new group, just click the '+ Create a New Group' button. A form prompts you to give the group a name, brief description and category. You can also add other information such as an email contact or the group's geographical location. At the next stage, you can customise your group's available applications, upload a profile photo and set privacy levels. It's all very similar to setting up a new Facebook profile. Be careful when choosing whether to make your group open, closed or secret. A secret group is desirable for work-related activity, but it won't show up in search results. A closed group may be the best option, enabling all Facebook users to find the group but requiring administrators to approve membership before a user can see the group's content. When you save the changes that you've made at this stage, you'll be prompted to publish the story to your Facebook feed. The final step is the trickiest. You'll be prompted to select people from your friends list to join the group. Simply ticking the box next to their name adds them. You can also invite people by email. Either enter their address manually, separating each with a comma, or click the 'Import email addresses' link to upload details from your webmail account. You may well be wondering whether social networks and work make a wise combination. Do you really want to give your office colleagues full access to your galleries, updates and Facebook profile? Australian call centre employee Kyle Doyle wishes he hadn't. He became infamous after admitting via his Facebook status that he was still too drunk after a heavy night to make it to work. When Doyle tried to claim the day as sick leave, his employer sent him a screenshot of his Facebook page, at the top of which was written: "Kyle Doyle is not going to work: I'm still trashed. Sickie woo!" Unsurprisingly, he didn't get his day off certified.